SANTIAGO - The 11 countries remaining in the Trans-Pacific Partnership after the pullout of the United States signed the revised trade pact on Thursday, in a show of unity in pushing free trade amid a rising protectionist threat by U.S. President Donald Trump. The Asia-Pacific countries seek to bring the pact, renamed Comprehensive and Progressive Agreement for the Trans-Pacific Partnership and known as TPP 11, into force in early 2019 to create a trade bloc covering nearly 13 percent of the world’s gross domestic product and some 500 million people. “Ministers shared the view that, by achieving a high standard and well-balanced outcome, the agreement will strengthen the mutually-beneficial linkages among our economies, boost trade, investment and economic growth in the Asia-Pacific region, and create new opportunities for businesses, consumers, families, farmers and workers,” they said in a joint statement. “The agreement demonstrates our collective commitment to an effective, rules-based and transparent trading system which is open to all economies willing to accept these principles,” it said. The signing by the 11 countries’ ministers in Santiago comes as Trump’s announcement of a plan to impose steep tariffs on imports of steel and aluminum for the sake of national security has raised fears of a trade war and possible stall in world economic growth. 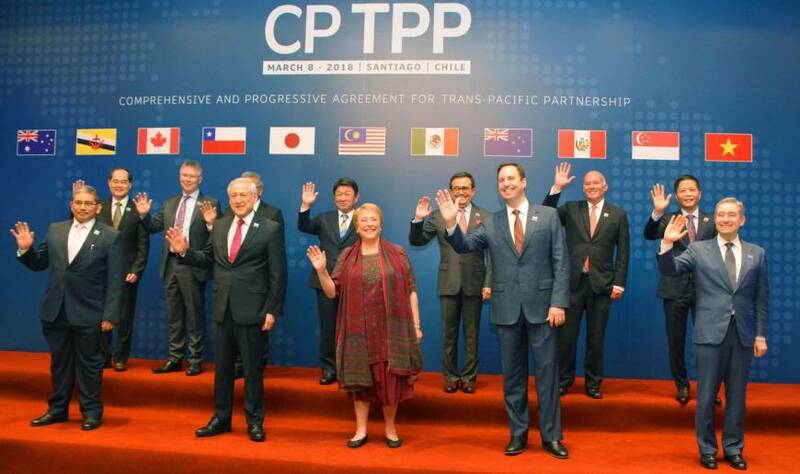 The TPP 11 members resolve to “contribute to maintaining open markets, increasing world trade and creating new economic opportunities for people of all incomes and economic backgrounds,” the preamble of the text released earlier said. They also commit to “enhance opportunities for the acceleration of regional trade liberalization and investment,” it said. The pact will go into effect 60 days after at least six countries complete domestic approval procedures. The Japanese government is set to present related bills to implement the deal to the ongoing Diet session later this month. Once implemented, the 11 countries hope to expand the framework to other countries, in particular the United States, whose return would mean the pact covers nearly 40 percent of global economic output and add security significance to the deal to counter China’s rising clout in the Asia-Pacific region. While they welcome the positive U.S. stance toward the TPP, the 11 states are committed to prioritizing the implementation of the TPP 11 and are against renegotiating the deal. The U.S. pullout put the pact, championed by Trump’s predecessor, President Barack Obama, into disarray in January 2017. Japan led the way in working out a new version of the deal, finalizing negotiations in January this year. The TPP 11 has eased conditions to put the deal into force. The original deal, signed by 12 countries including the United States in February 2016, could never be implemented after the U.S. withdrawal as it required six countries, accounting for at least 85 percent of the original 12 signatories’ combined GDP, to complete domestic procedures to bring it into force. The United States alone represented more than 60 percent of the total GDP. 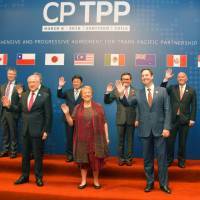 Under the CPTPP, the application of 22 provisions in the original pact, such as on intellectual property that have been included due to strong requests by the United States, will be suspended until such time as Washington may return to the deal. Japanese officials said that by not changing agreements on countries’ commitments to market access, the CPTPP has maintained the high-level standards of trade and investment rules.